Why settle for flat embroidery when you can create dimensional embroidery? All you need is your embroidery machine and Deborah Jones to show you how! Embroidery expert, Deborah Jones has just released her second book-Dimensional Machine Embroidery. In this book you'll learn to enhance your machine embroidery skills with specialty techniques that make your work beautiful to the eye and amazing to the touch. Your embroidery will come to life with traditional and raw-edge appliqué, trapunto, wing needle and shadow work. With clear step-by-step instructions and handy tips and tricks for each technique, you'll be rewarded with beautiful and professional-looking results. This 112 page, full color book also includes a Create with Nancy DVD that highlights many of the techniques featured in the book. Plus! You can master the techniques with the accompanying projects: elegant lace coasters, a cozy embroidered elk blanket, a funky giraffe footstool and more! Recommendations for specific fabrics, stabilizers, needles and notions to use with each project, for spectacular results every time. 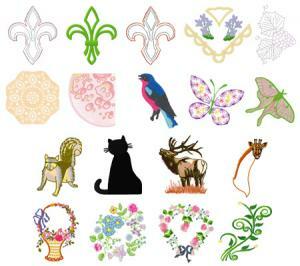 A DVD containing 18 embroidery designs from the projects featured, as well as bonus designs for the wing needle and shadow work techniques.